I tried out a new cookie recipe and browned the butter, adding some more caramel notes. It was an awesome cookie dough that came together in no time, and the results were incredible! I immediately took Michael some cookies and milk, since he’s working late this week. The end of the month, the end of the fiscal year, and the upcoming holiday weekend are creating the perfect storm for him. I’m so grateful that he’s got an awesome work ethic! Back to cookie talk. The toffee blended into the cookie, leaving just a bit of crispness and lots of flavor. 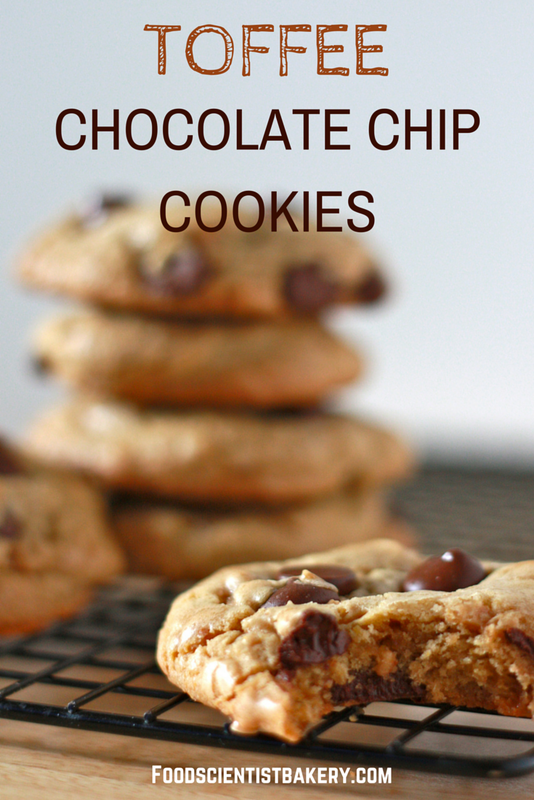 I packed them with dark chocolate chips, because chocolate = life. 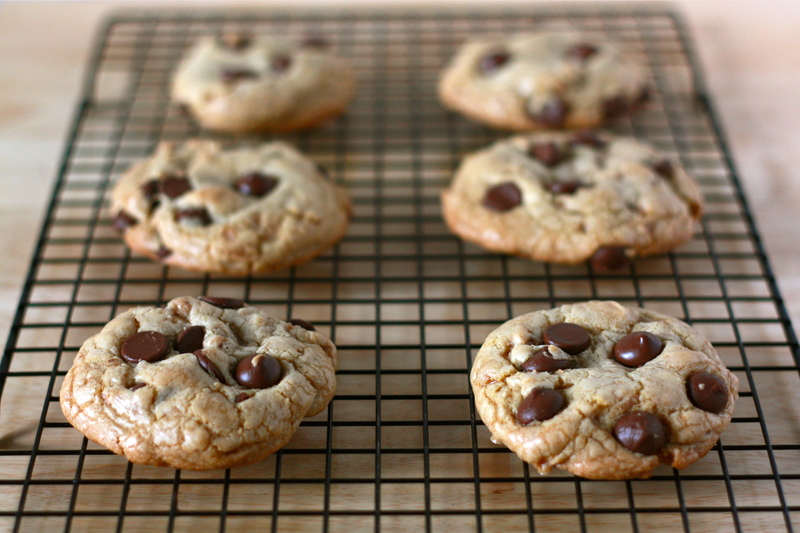 Even if you’re not huge on toffee, this chocolate chip cookie recipe is kind of the bomb. The cookies came out perfectly, they were easy to bake, no weird ingredients, and no need to chill the dough for 3 days! Preheat oven to 325 F. Line two cookie sheets with parchment paper or a silpat. In a medium skillet, melt butter and let heat on medium without stirring until browned and fragrant (3-5 minutes for me, but it can vary). Place browned butter in a bowl and set in the freezer to cool. In a stand mixer, beat sugars, vanilla, egg, and egg yolk. Mix in flour and baking soda until just blended. Add the cooled butter and blend well. Stir in chocolate chips and toffee bits. Roll cookie dough in heaping tablespoons onto sheets. Bake for 11-14 minutes or until the edges are lightly browned and middle is puffy. Cool on baking sheets and then move to wire racks to cool completely. These look delicious! 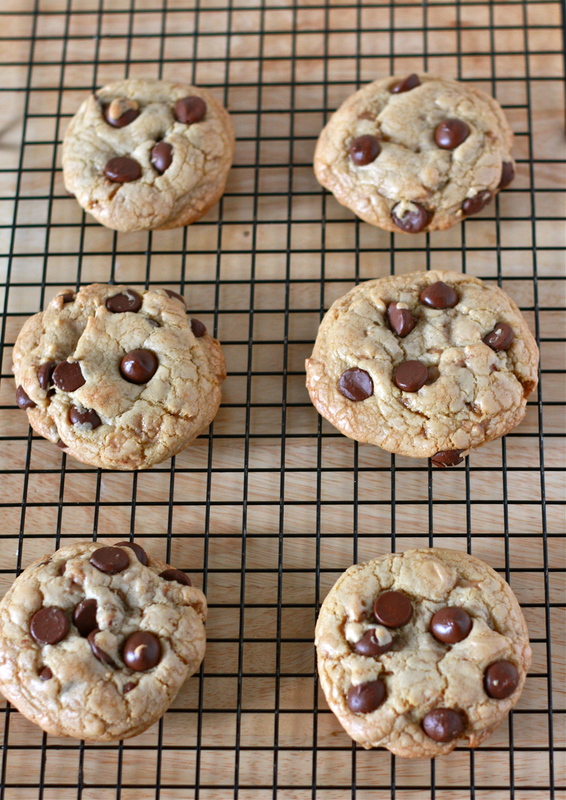 I must try browned butter in chocolate chip cookies, haven’t yet and it sounds delicious!! Oh yes, you’ll love it. It takes some getting used to when you’re trying to decide if it’s brown enough, but it really is worth it as far as flavor goes! This recipie looks INCREDIBLE! I was wondering though, is it a hard toffee or a soft toffee that I should be using for the cookies? It’s a hard toffee. I used Heath Baking Bits, which are in the baking aisle of most grocery stores in my area. If you don’t have those, I’d recommend buying two or three Heath bars and chopping them up by hand until you end up with small bits of toffee. Hope that helps! Thanks! I can’t get that brand in Australia however, would werther’s orginal toffee candies work? Oh, yeah! I bet that would taste great 🙂 Let me know if you try it!